A presentation by Charles Mopps, senior project manager for Atkins, was the focus of the commission’s afternoon session on March 23. As he discussed the results of a peer review of the Lido Renourishment Project proposed by the U.S. Army Corps of Engineers (USACE), Mopps alluded a number of times to a lack of information about whether the USACE had undertaken certain steps in preparing the proposal. City of Sarasota Engineer Alexandrea DavisShaw told the board during the public comments portion of the meeting held after the presentation that she would be happy to facilitate the discussions. The $19-million project is a joint effort of the city and the U.S. Army Corps of Engineers (USACE). “I would really like to make sure those questions get answered,” she said. Vice Chair Paul Caragiulo made it plain during an exchange of questions and answers with DavisShaw that no one objected to the plans for Lido until after Big Pass was deemed the sand source. DavisShaw said she would have to double-check with the USACE, but she believed the last time the federal agency evaluated sand sources for the project was about two years ago, and Big Pass was the primary viable source that was also financially feasible. 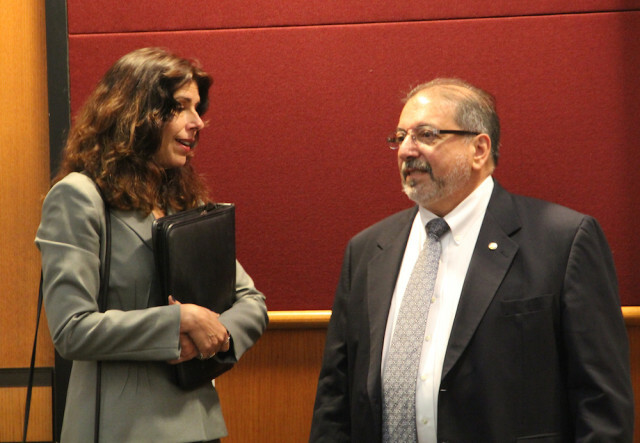 Getting answers to questions the Atkins team posed — and that Sarasota County stakeholders have asked — “would be the most prudent and cost-effective follow-up at this point,” Wreford told the commissioners. Commissioner Carolyn Mason also pointed out, “There is a group of citizens that has asked questions” about the Atkins report, and those people have not received responses. “I would like to see those questions get answered” she added, with the commissioners copied on the responses. County Administrator Tom Harmer promised to work with staff on the meetings to delve into the information gaps and report back to the County Commission on a regular basis. DavisShaw also explained that the city and the USACE are seeking a state permit for the dredging of Big Pass, with monitoring requirements. The USACE would not be able to use Big Pass as a sand source for the next dredging in the 50-year proposed life of the project unless the sand in the shoal was replenished naturally as expected within the predicted time period. 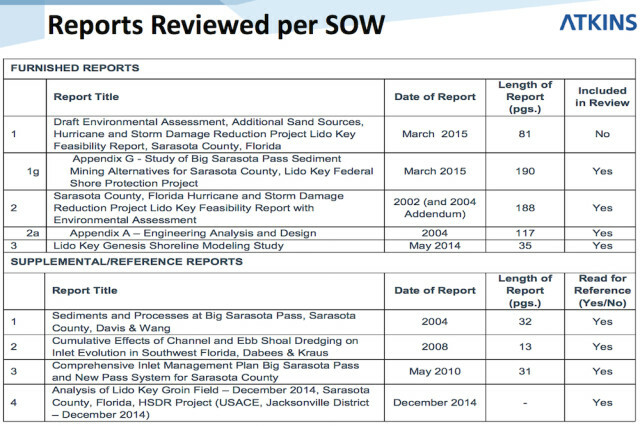 The documents the USACE provided to the Florida Department of Environmental Protection (FDEP) say the plan is to remove 775,000 cubic yards of sand from the pass in the first nourishment. DavisShaw also noted that less sand would be dredged in subsequent renourishments of Lido because two planned groins on south Lido would keep more of the sand in place. She added that she anticipated the second project would occur seven to 10 years after the first one, and if Big Pass could not be used as the sand source then, the city and the USACE would utilize New Pass. “Construction is not funded yet,” she noted. However, USACE Project Manager Milan Mora has told her that, as he sees it, “acquiring a permit accelerates the funding likelihood.” The USACE has confirmed that to The Sarasota News Leader. Earlier this month, USACE spokeswoman Amanda Parker told The Sarasota News Leader that President Barack Obama’s 2017 fiscal year budget does not include funding for the project. However, Parker noted, Congress could take a different stance. Commissioner Mason also took the opportunity on March 23 to seek clarification from DavisShaw about who would issue the permits for the project. DavisShaw told her that it would be FDEP. “Not Sarasota County Government?” Mason asked. 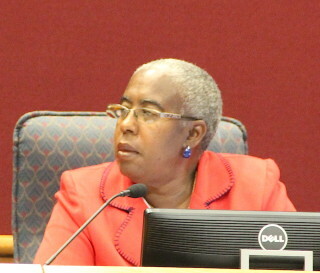 When Commissioner Christine Robinson asked what would happen if the groins proved to stabilize the beach but led to erosion in the county-owned Ted Sperling Park on south Lido, DavisShaw pointed out that the USACE has decided to use a design that would allow adjustments of the groins if problems arise. 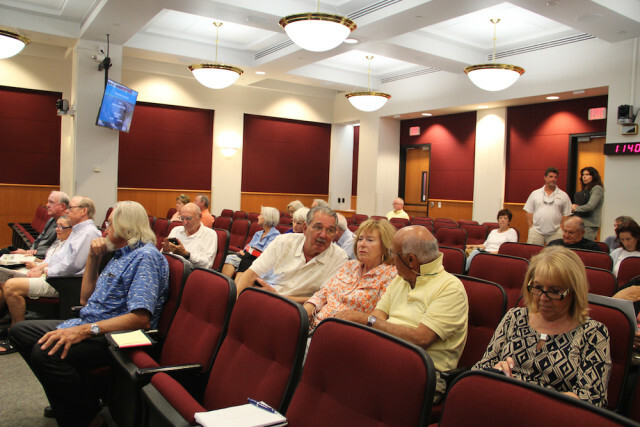 About 70 people attended the meeting, with the number of people from Lido Key making public comments outnumbering those from Siesta by a margin of 11 to five, according to a News Leader count. Laura Bryg, who told the board she is a member of the Save Lido Beach Committee of the Lido Key Residents Association, invited the commissioners to visit the beach, so they could see the erosion firsthand. 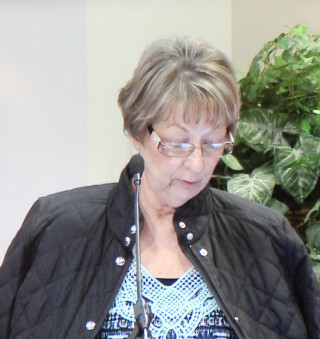 Lido homeowners are interested in “actual uses of sand,” she added, instead of “theoretical possibilities of impacts.” She asked the board to “address the immediate devastation of Lido Beach” as Siesta Key continues to accrete sand. Commissioner Robinson and Vice Chair Caragiulo sought the most clarifications from Mopps as he made his remarks. And Mopps apologized at the outset for having to handle the presentation. Todd Walton, former director of the Beaches and Shores Research Center at Florida State University and now an Atkins staff member, was the “founding father” of the report, Mopps told the board. However, Walton had a family emergency, necessitating Mopps represent the firm. Much of Mopps’ focus was directed at the types of models the USACE ran in preparing its proposal for the Lido Renourishment Project. For example, he explained that the GENESIS model the USACE used to study the potential impacts on the county’s shoreline at Ted Sperling Park on South Lido “typically doesn’t show sand transport,” so it probably was not the best one to use for that purpose. Further, he added that after the USACE removed the third groin from the original proposal, the Atkins team could find no indication that the USACE ran another model to show how eliminating that structure would affect the plan. As the peer review summary of findings put it, no evidence was provided to show that the GENESIS model could predict how sediment might flow around or through the groins. The other model the USACE used in its studies — relating to the proposed dredging of Big Pass — Mopps explained, is called CMS, which he characterized as “very cumbersome,” because if a researcher loads in too much data, it does not react in the desired manner. Additionally, he said they could find no indication that the USACE had undertaken a verification process with the CMS model, which would encompass several runs incorporating data from past events, for example, to show that the model was accurate in its predictions. For example, Mopps pointed out, a researcher could use data recorded during the 2004 hurricane season to verify that the results of the USACE model runs were accurate. “You just want to make sure there’s competency in the process,” Caragiulo summed it up. Mopps said Caragiulo was correct. In response to a question from Robinson about what type of data a CMS model uses, Mopps said that current strength, wave data and sediment movement were among the variables. Moreover, he explained, it is a two-dimensional model. To provide support of the CMS findings, Mopps said, Atkins recommends the use of a three-dimensional model called Delft3D. Chair Maio pointed out, “We’re designing roads these days with three-dimensional models,” so why would the USACE not use one in its studies of the potential results of dredging Big Pass? The USACE “pretty much developed” the CMS model, Mopps replied, whereas the Dutch developed Delft3D. Before he joined Atkins, Mopps told the board, he served as the coastal projects manager for Charlotte County. In preparation for dredging through the ebb shoal in Stump Pass to create a new pass, he added, staff used the CMS model. However, he continued, when Charlotte County created its long-term management plan in advance of putting a groin on the very southern end of Manasota Key, it used the Delft3D model to make certain the structure would not damage the shoal or disrupt the natural flow of sediment from north to south. “After you did it, after you build it, Mother Nature is going to do what Mother Nature wants to do,” Mopps pointed out. Robinson sought further clarification, telling Mopps that in listening to his discussion, what came to her mind was the dozen or so models hurricane forecasters create when a storm is brewing to try to determine what will happen. Would use of the Delft3D model be standard practice, she asked. “It would be above and beyond,” he responded. The Lido project has been proposed with almost two-thirds of its funding from the federal government, he added, reiterating that the CMS model is one primarily developed by the USACE, which is a federal agency. He added, “CMS is a great model if everything is added into it the right way, and the information’s up-to-date” and loaded into the model correctly. One run of the model is all that is necessary under those circumstances, he explained, as long as the verification and calibration process has been used to show that the model’s run can predict the outcome with a high degree of certainty. In response to a question from Commissioner Charles Hines, Mopps conceded that model runs “aren’t cheap.” However, it would not have been that expensive to undertake another CMS model run to show the expected results from removing one groin from the USACE proposal, he added. 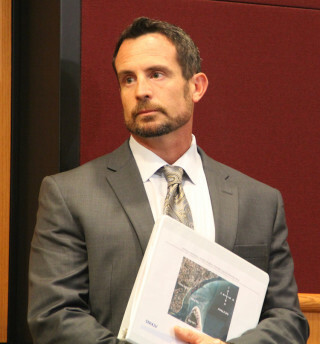 Caragiulo questioned a finding in the peer review showing that the erosion of Lido Key would be expected to continue to occur at a rate of approximately 12,000 cubic yards a year. The City of Sarasota added about 363,000 cubic yards of sand to the beach in its emergency project undertaken in January 2015 to deal with damage inflicted by Tropical Storm Debby in June 2013, Caragiulo pointed out. Yet, by late April, most of that sand was gone. “The escarpment is huge,” Mopps agreed. However, he explained that winter tides “could have a more drastic effect” on the beach than spring or summer tides because of the way the currents change according to season.